Pourable Dressing, multiple uses. A rich creamy Tartare Sauce with the perfect blend of gherkins, capers and parsley. 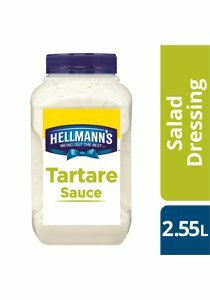 HELLMANN'S Tartare Sauce is a mouthwatering accompaniment to your favourite seafood dishes. Servings per pack - 63. Serving size - 40 ml. Consistency; saves time and provides excellent cost control. Seven varieties ensures there is good range of flavours to suit every menu and customer tastes. Highly versatile, ideal for multiple applications.